The thrills of the 2017 Dacia Magic Weekend are just around the corner and a young Express reader can be part of the day when Castleford Tigers are in action thanks to a once-in-a-lifetime competition we are delighted to be offering. It is every young fan’s dream to lead their team out onto the pitch for a big match and in conjunction with the Rugby Football League we can make that dream come true. We are offering a chance for a boy or girl aged seven, eight or nine to walk out as a mascot with Castleford Tigers when they play Leeds Rhinos in front of a huge crowd at St James’ Park, Newcastle on Sunday May 21. The winner of our competition will also receive four Magic Weekend reserved tickets, worth more than £200, so the family can share the special day. 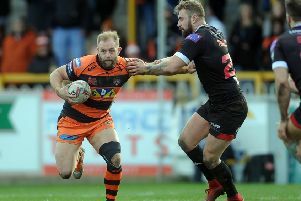 The Tigers have a good recent record in the Magic Weekend and will be hoping to match their success last year when they beat Warrington Wolves 34-14. But this will be the first time they have met local rivals Leeds in the event and it is sure to be a thrilling game. What was the final score in Castleford Tigers’ Magic Weekend clash with Warrington Wolves in 2016? To enter, email your answer, along with your name, address and daytime telephone number, as well as the name and age of the mascot to tony.harber@jpress.co.uk before the closing date, which is Wednesday, May 3. The winning mascot must be aged between seven and nine years-old. They will be provided with a t-shirt to wear but they will need to bring their own shorts, socks and boots. Tickets for the Dacia Magic Weekend are available from £25 and can be purchased by visiting rugby-league.com/tickets or by calling the Rugby League Ticket hotline on 0844 856 1113 (calls cost 7p plus your network connection).